There is no steadfast rule on the frequency of a chimney cleaning. It can vary from once a month to once every ten years depending on a variety of factors. The National Fire Protection Association (NFPA) recommends that chimneys, fireplaces, and vents be inspected once a year and cleanings, maintenance, and repairs should be done if necessary. All chimneys - yes, (wood, coal, oil and gas) should be thoroughly inspected once a year by a chimney sweep. Never assume your chimney is safe even if you seldom or never use it. There is a whole host of problems that could cause an unsafe chimney or fireplace. It usually takes about an hour to clean most masonry chimneys including setup of tarps, vacuum and tool and taking them down. We guarantee absolutely No Mess in your home. Pre-fab fireplaces typically take about 35-45 min. Inserts can take from 1-3 hours depending on how often they are cleaned, the type of wood burned, and the way the stove is operated. (Choked down to slow smolder type burning will produce more creosote taking longer to clean.) There is no mess. 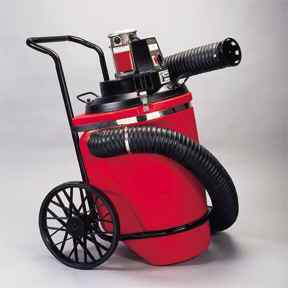 We have tarps, vacuums and brushes to clean your chimney without making a mess in your house. What does a chimney sweep entail? First, a visual inspection is done of the chimney system. This is done to determine whether a flue needs to be cleaned and make sure it’s safe to clean. Once this is done, the proper size brush is attached to flexible rods one by one and pushed through the flue. A drop cloth will be will be placed in front of the fireplace and a high powered vacuum running for dust control. We clean most chimney from inside the home. Upon entering your home we are careful to find the best way for us to get equipment and personal in and out of your home. We need some space in front of the fireplace to spread out the 9 x 12 ft tarp that covers the carpet and hearth. "Special Stuff" on the mantel or walls above the fireplace is safe. If you want to remove items on the mantel please do. We set up all needed tools and our special chimney vacuum to aid in dust control. We wear coveralls, gloves and a respirator to protect us from harmful creosote dust and ash in the chimney. We assess the chimneys condition noting any problems and proceed with cleaning. We remove the damper blade and handle (if possible) to check	for rust and missing parts. While cleaning the firebox area we are checking for cracks in brick and missing or severely eroded mortar joints. On "Pre-fab" models fireplaces we are checking for cracks in the back and side refectory panels in the firebox. Some hairline cracks are acceptable and a part of normal operations, however we are looking for larger cracks and gaps that will allow fire to reach the metal box enclosure of the fireplace. This can cause damage to the firebox making it unsafe for use. These panels are replaceable so do not fear. We can most likely find and replace old damaged panel making your fireplace usable again. On masonry chimneys we reach up inside the smoke chamber area with hand brush to clean the breast area and the sides where the larger brush misses. Next, we insert a steel wire brush attached to a flexible fiberglass rod and clean the upper smoke chamber area. The brush is pushed up into the flue, working in a scrubbing motion with sections of fiberglass rods added until the brush exits the top of chimney. Why does my chimney need a cover? Have you ever heard of the inside of someone's home being "trashed" by an errant bird or squirrel? Or dampers rusting out of fireplaces? Or the mortar in chimneys being slowly eaten away? The damage caused in any of these cases can be quite expensive to repair, as well as inconvenient. The simple installation of a chimney cap can prevent tragedies such as these. Will a chimney cap prevent animals from "moving into" my chimney? Birds, squirrels, and raccoons - all of them consider chimneys the ideal place to safely raise a family...or enter a house easily. When they nest, they bring fleas, ticks and other messes with them. If they enter a house, they often panic - wrecking furnishings as they try to escape. Some smart raccoons, of course, find the chimney the perfect "gateway" to the kitchen, tracking sooty paw prints all over everything as they trek back and forth to the pantry. Cute? Maybe. Destructive? Definitely. Don't wait until the raccoon's nest in your chimney this Spring. We'd be delighted to show you the caps we have to offer. You can usually save money if you get a chimney cap at the same time your chimney is swept or inspected. What can I do about the birds in my chimney ?? The chimney swift, a colony bird from South America, spends the summer in your chimney nesting, raising their young and getting ready for the long flight back to the forests of Peru. Chimney Swifts on average eat several times there weight in flying bugs such as mosquito's. Being a colony bird they will return to the same chimney they hatched in each year. We start seeing the birds in this area mid to late April. They stay until mid Sept and are usually gone by the first cold snap. We like to wait until the birds are gone or between nesting activity to put out the "No Vacancy" sign. These birds can have 1-2 nesting a year depending on weather and other factors. The hatching period usually lasts 4-5 weeks with a 1-2 week period between hatchings. We recommend cleaning the chimney if to remove the bird debris and any flammable material that may be in the chimney area. Next step is to install a stainless steel chimney cap. This will prevent birds, squirrels and other animals from entering the chimney along with rain and leaves. From then on your bird and small animal problem is solved and you are the hero. So, make that call today to schedule your appointment. Don’t fret about swifts in your chimney, they only need it in summer when you’re not typically using it anyway. Get your chimney cleaned early in spring, before the birds arrive. Not only is creosote build-up a fire hazard, but it also prevents nests from sticking. With a clean chimney, there’s less chance that baby birds will tumble down the chimney. What should I know before buying a new chimney cap? Chimney caps or covers are made in various styles with different materials - ranging from heavy pieces of slate placed on "columns" at the flue top, to painted metal or aluminum caps that attach to the chimney liner. What you should look for in a chimney cap is one that will keep out rain and animals, but that can be easily removed for chimney inspection and maintenance. The list goes on and on. In conclusion, consider the following: when an insurance company insures your property, it does not do so because you are going to have a problem, but because possibly you could have a problem. When we inspect a chimney and fireplace, they, and you, hope they will not find any problems. But if there are any there, you certainly want to know about it. Our complete and thorough chimney inspection will include include rooftop, attic, firebox and foundation inspections. What causes the mortar around my chimney to need replacement? Rainwater that gets in your chimney mixes with the ash in the flue, to form corrosive lye. This eats away at the mortar and at the metal of the damper, shortening the useful life of both. Maybe you have noticed your damper is rusty or hard to open or you have found puddles in your fireplace. Both are signs that you need a cap. If the damper pins or casing rust out, it can cost anywhere from $300 to $600 to have the old casing ripped out and a new one installed. On heatilator type fireplaces, the dampers are virtually impossible to replace. And, of course, if the mortar in a masonry chimney goes, the cost of repair or replacement is quite high. YES, we repair fireboxes, replace lost or damaged damper blades or install a Lock Top® damper if a replacement blade is not available. We also repair crowns, replace chase covers, install chimney caps, and waterproof chimneys. If you are having problems with your chimney, we can most likely find a workable solution. I have rust stains on the top and running down the siding of my chimney. What causes this and what can be done about it. Pre-fab fireplaces have a metal covering (chase top) to prevent water from entering the interior of chimney structure. The chase top is usually made of a galvanized sheet metal. Over the years the metal coating wears off from sun, rain and other forces. Most tops have a low spot that holds water as well. When you get pine straw and leaves blowing around some are bound to get stuck on the water that has collected during rain, snow, ice storms. Pine straw and certain leaves are very acidic when they are decomposing especially when sitting in water. The acid break down the galvanized coating and you soon get bare metal. 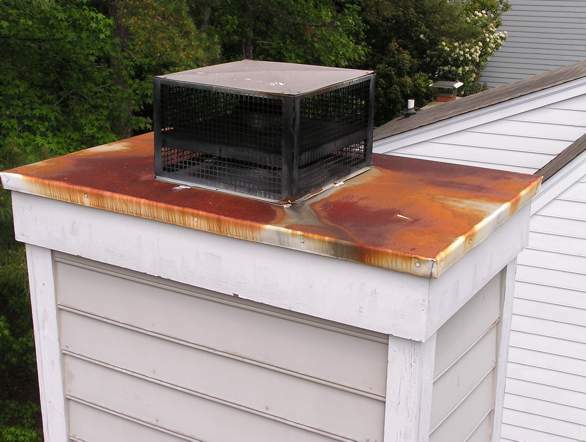 The best way to fix the problem is to remove old rusted chimney top and replace with new one. We use and recommend stainless steel for its strength and ability to resist rust. You can use the regular galvanized metal when is less costly but not as long lasting. The cost difference is usually $50-$75 less than stainless steel. Oh, another thing, the stainless steel top has a lifetime warranty against rust, corrosion and manufacturing defects. The galvanized cap only comes with a 12 month warranty against rust and manufacturing defects only. The white stains or powder-like material is often the result of water penetration of the chimney. During a rain, snow, or ice storm water is absorbed by the brick and mortar crown. In the case of snow or ice storm the freeze thaw cycles can enlarge the cracks on the top of the chimney mortar crown allowing water to enter the structure this way. The chimney will soon saturate with water. As the chimney dries, lime and salts from brick and mortar are pushed out of the pores of the chimney. Wood in contact with the chimney can also absorb water, and in most cases, start to rot. This is a common problem that we can help prevent. The cost of this service depends on many factors. Call us for more info or to schedule a visit. The first step is a visual evaluation of the chimney crown, mortar joints and flashing. Often we find the crown has cracks caused by shrinkage of the mortar during construction. These start out as hairline cracks but get bigger over the years from freeze thaw-cycles and the natural expansion-contraction that occurs during the spring & summer seasons. If the chimney has darkened from mold and mildew, we recommend cleaning the surface of the brick with a power washing. This opens the pores of the brick and cleans off mold and mildew deposits. We apply a layer of CrownSeal on the mortar crown sealing the cracks but remaining flexible to allow for expansion-contraction cycles. Afterwards then apply the water repellent product ChimneySaver® with a low pressure sprayer. Both products have a 10-year warranty and we have confidence in their ability to perform as stated. Why should we choose Ruchala Chimney Sweeping as our chimney professional? We can give you the names of past customers, realtors and property management company's we have performed chimney services for in the past if you desire. 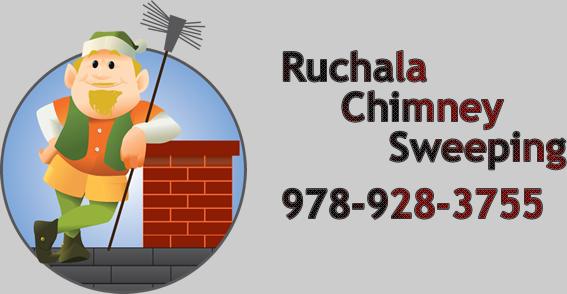 Ruchala Chimney services most of central Massachusetts. Feel free to call us with a question not covered by our FAQ section. We pride ourselves in Customer Service and are standing by to answer your questions. To schedule an appointment, please call us at 978.928.1121.